You may well have heard the phrase "a Sunday well spent brings a week of content" and that was very true yesterday. There is something really nice about eating and sharing good food on a Sunday. It gives you that warm feeling of friendship and just puts you in a better mood, well that's what I find anyway. It always helps when you have been food shopping and have lots of yummy food in the fridge to choose from. 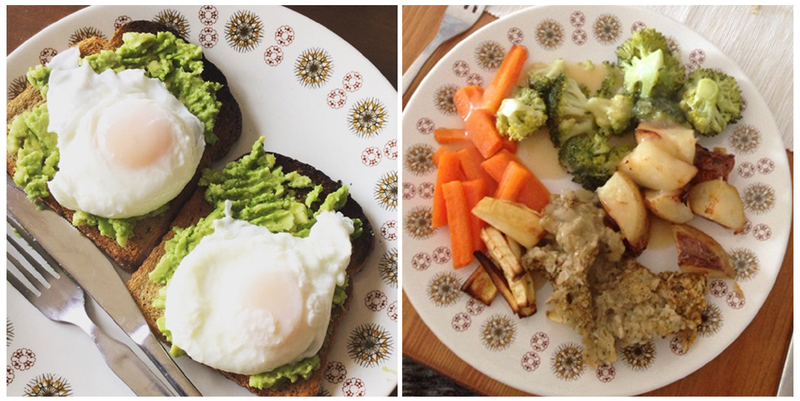 Yesterday was all about Avocado and Poached egg on toast for breakfast to start the day off right and then a big old Veggie roast dinner, as I had a friend coming over who is trying to keep off meat for a bit, so I thought for ease I would go meat free too. Got a few leftovers for my Monday lunch too, another bonus of cooking up a storm on a Sunday! I always find I have more interest in cooking something different at the weekend as I have a bit more time I think. What's your favourite foods to make on a weekend?